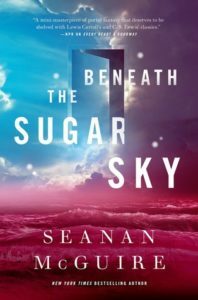 Beneath the Sugar Sky is a thrilling sequel to the Wayward Children series. It has gorgeous writing, more magical worlds, and story lines from previous books which are magically developed. I knew I would love this book from the very first paragraph. McGuire’s lyrical and magical writing hooks you from the beginning. Speaking about those adulthood rites, those moments when we lose our childhood playfulness and ‘grow up’ were words that connected with me. The writing is spectacular and I’d love to hear it aloud. Even more so, the wondrous writing is only matched by the detailed descriptions of the magical worlds the children travel to, as well as the character depth. I loved the diversity within the pages and the colorful logical, and nonsensical, situations these heroes get themselves into, and out of. In this book, there’s even more developed in terms of series and I loved every moment of it. Also I really loved our main character for this book, Cora. For me, this entire book was just so satisfying. I could see where all the threads from previous books came together and wove into this stunning tapestry of color. You need a copy of Beneath the Sugar Sky on Amazon(US), your local indie, and on Goodreads. What magical world would you travel to?